They were snuggling on a bench, looking adorable, when I asked them to look at each other. In one synchronized move, they turned to face each other foreheads first, brows furrowed, lips pursed playfully. A move oddly reminiscent of cats play fighting. Not exactly what I had in mind, but pretty priceless when you are so in sync with your fiancée that you have the exact same response to your photographer's direction! I am passionate about working with couples to plan engagement sessions with meaning. Not strangers to romance, these two didn't disappoint. Rem proposed to Abby - a self-proclaimed Francophile - in Paris, so their decision to start the session at Bar Tabac, a favorite local french bistro, on the anniversary of their engagement, was perfection. Fortified with a little champagne, coffee, and fries, they were unphased by the blustery day as we set out to take some photos in the neighborhood. 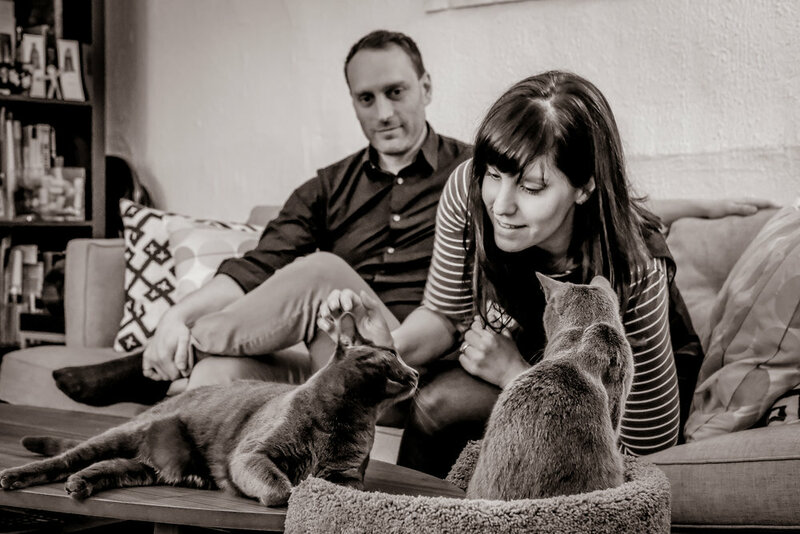 We finished back at their apartment with their feisty and adorable Russian blue cats. A perfect end to the session, as Abby said: "after all they are our babies". Abigail and Rem, thank you for inviting me into your lives, sharing your passions and most of all for introducing me to your beautiful kitties. I can't wait to photograph your wedding in June!